As a gangly schoolgoing teenager, sometime back in the pre-digital 20th century, a number of different daily newspapers would appear on a regular basis in the games room of the school I attended in Monaghan. As a boarder, the daily newspapers provided a much-valued link to the outside world beyond the Colditz-like confines of a 1970s establishment that was run by priests. 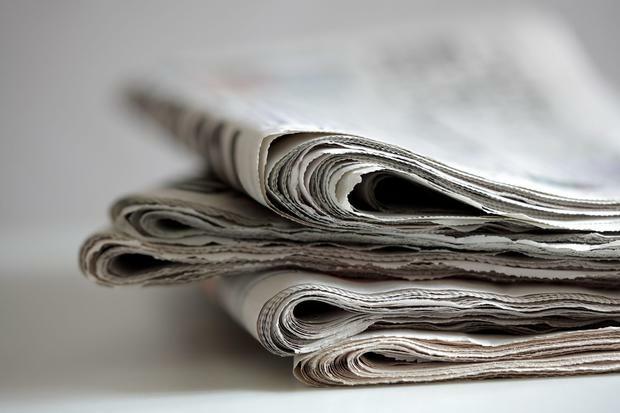 Reading newspapers, we were told, was an important activity that would broaden our minds and opinions, help us stay informed about what was going on in the world and, in general, develop our overall media literacy skills. What we didn't know at the time was that these newspapers didn't appear miraculously by osmosis, but were part of a much wider initiative called Newspapers in the Classroom which was overseen by the Irish newspaper industry. A marketing-led initiative that was aimed at hooking the reader of tomorrow, it was also rolled out to encourage school-goers to read important stuff like how modern Ireland was beginning to take shape, what was going on across the Border, a mile up the road, while hopefully instilling in young people the importance of keeping up to speed with what was going on in the world, a skill set that would always stand by you on your journey through life. Media literacy skills in those days were a lot simpler and trust in the media was, more or less, implicit. If stories were inaccurate or fake, the authors, publishers or broadcasters were quickly rumbled and, if necessary, acknowledgements and apologies were duly published or broadcast. While Newspapers in the Classroom is no longer, NewsBrands Ireland has replaced it with Press Pass, a student journalism competition rolled into a media literacy initiative that aims to equip students - mainly in transition year - with skills to interpret information, understand language, present and analyse arguments as well as developing their own narrative and persuasive abilities. In case you missed it, last week was European Media Literacy Week, the aim of which is to raise awareness about the importance of questioning the veracity of content that people read and hear online or offline and help them to identify sources of information that may be unreliable, deliberately false or misleading. Set against a backdrop of so-called fake news, the deliberate manipulation of social media algorithms and alleged interference from state-sponsored organisations to influence elections, the campaign is a worthy initiative and comes at an important juncture for society and democracy. The Irish end of the campaign is overseen by Media Literacy Ireland (MLI), a volunteer network made up of key stakeholders in the media industry ranging from NewsBrands Ireland, RTE, the Association of Advertisers in Ireland (AAI) right through to companies like Google and Facebook. To back up its case, MLI published details of a Eurobarometer survey which noted that 83pc of Europeans think fake news is a threat to democracy while 73pc are concerned about the levels of disinformation they encounter in the run up to elections. While it is important that these issues are tackled head-on for the sake of our democracy and society in general, the elephant in the room in all of this is the role social media platforms have played in not only disseminating fake news and fake advertising, but also the more sinister role they have played in fostering genuine addictive behaviours, whether by design or default. And there's no shortage of science, expert medical opinion and, speaking from experience, parental anecdotes to back this up. When the CEO of Salesforce, Marc Benioff, stood up at the World Economic Forum in Davos in 2018 and likened social media addiction to smoking, he wasn't joking. But so far social media platforms have refused to take responsibility for that power they have on their users and regulators seem incapable of dealing with the consequences of all of this. I could of course add to this, their contribution the overall dumbing down of society to one where a video of a cute cat dancing in a bath, a celebrity showing off her new Versace handbag or a woman popping somebody's pimple is often deemed to be more important or interesting than, well, the real world around us. So, perhaps our understanding and definition of what media literacy entails in 2019 should be widened to include the role social media plays in our daily lives and the impact it has on people, their mental health and society. If Marshall McLuhan's oft-quoted expression, 'the medium is the message' ever needed validation, it's there on our phones, tablets and PCs. First we had Daniel & Majella's USA Road Trip, now we have the most unlikeliest bromance of them all as sports commentator Marty Morrissey hooks up with comedian and radio presenter Bernard O'Shea for a new two-part show that will take the duo on a journey from Curragh to the Bronx. Called Marty and Bernard's Big Adventure, the show will get its first airing on RTÉ tonight and will be sponsored by Fiat as part of a deal brokered by Core Sponsorship. Bloom, the agency behind the current Brady's Irish Ham campaign - set to the tune of a popular rebel song - has also launched a new campaign for Associated Brands, the Trinidadian company that owns the retro-looking Catch bar. While Associated might not mean a lot to Irish people, Catch was in fact first developed in Dublin by HB Chocolates on the Belgard Road, Tallaght and has had a presence on the Irish and other international markets ever since.